3:45. That was the magic number. My finish time? 3:45:00. How sweet is that !?!? We're going to Boston in 2011 !! As race day approached I had no doubt that Karla an Lisa were going to qualify but I have to admit, I knew that for me to make it I would have to have nearly everything fall in to place perfectly. Good weather, a good strategy, good hydration and a lot of luck. Well, the weather cooperated. It was a cool and dry morning and with all but the last three miles in the shade overheating would not be a problem. The strategy was to go out easy on the rolling hills in the first three miles to the trail. Did that successfully hitting 3 miles in 25:21. Once on the trail the plan was to use the slight up and down grade to my advantage. Most of the time the ups and down are almost imperceptible but at times it is noticeable if you are paying attention and if you are familiar with the trail you can adjust the effort accordingly. Soon after turning onto the trail I noticed a group of 5 or 6 runners that all seemed to be aiming for about the same time as me. When I would notice a slight incline I would back off the effort a little and they would pull ahead but then when the trail started going down I would slowly pick the pace back up and gradually reel them in. The first turnaround was about the 7 mile point of the race. It was a little hectic for a few minutes with runners trying to figure out which side of the trail to run on to avoid the runners coming in the opposite direction but soon the crowd thinned out and was never a problem again. I was enjoying looking to see who I knew in the race in front and behind me but waiting to see where my ladies were at. When I spotted them they were hanging with the 4:00 pace group and looking great. Our friend Eric Nesbit was running with them at this point too. Over the next many miles everything was going well and really quite uneventful. My strategy was till working well and my energy level was smooth. I passed the halfway point in 1:50:57, about a 1:30 minute cushion over what I need to run and I was still doing the yoyo thing with the others around me since mile 3. I got a great boost at about mile 16 when I saw The Trail Angel out cheering and taking pictures. As I passed by I was feeling great and now I just had to maintain for another 10 miles. Easier said than done but I was very confident now with everything going so well. I was cruising along the next few miles but as I approached the turnaround at mile 19 I noticed I was feeling a bit tired but when I checked my split I was almost shocked to see that I had slowed down so much that mile. 9:08 for that one and just like that I had lost a 3rd of my cushion. This was not good. I couldn't begin to fade this fast with 7 more miles still to go. I grabbed some water and a Gu and walked around the turn barrel while I mentally prepared myself for the push to the finish. This was beginning to look like a repeat of Myrtle Beach 2006 and I knew that I needed to keep my focus. Once again I thought about Karla and how important it was to both of us to get back to Boston. I thought about my parents that I knew were watching the clock at home and praying for me. I thought about Lisa and all my friends that were out there pulling for me. And I began to run again knowing that I had to go for it whether I felt good or not. Fortunately once I began to run I did feel good again and despite the short walk break I still ran mile 20 in 8:20. Now if I could just hold on, stay calm and relaxed and keep moving. I backed off the effort a little not wanting to push too hard now. I was beginning to feel that my hamstrings were starting to cramp up and I knew if they did my qualifying bid was over. I was praying and asking God that if he would just let me run without cramping, I would do my part and run my heart out to make it in time. I backed off the pace slightly hoping to hold on and not lose too much more time until I could get back on the road and the mostly flat and downhill finish. I once again passed by Laura and told her it was going to be close as she cheered me on. But I was still losing time and my energy was waning. I turned onto the road with less than 3 miles to go but mile 24 was a slow and painful 9:24 and like that my cushion was gone. It would have been so easy to give up now. I was slowing down every mile, I was tired, and I was hurting, but I was not going down without a fight. I had a mission to complete and if I was going down I was going down in flames. 2.2 miles of pure pain to look forward to but I had to go for it. So I picked up the pace one more time determined to hold it as long as I could. I know everyone I passed by in the race or spectating must have thought I was dying the way I was gasping and groaning with a look of near death on my face. Every fiber of my body was begging me to stop and walk but I knew I couldn't . I had to qualify and then be there to wait at the finish to celebrate with Karla when she would come in soon behind me. So I pushed and groaned and gasped fighting off nausea and cramping until finally when I could see the 26 mile mark ahead and checked my watch I finally knew I had done it. What a relief to cross that line and know I had done it. And what a difference in 4 years. 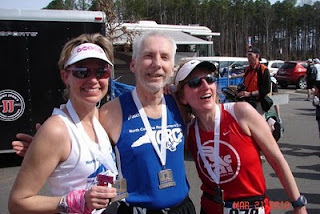 In 2006 I finished in tears knowing that my dear friend was facing surgery and months of chemotherapy and radiation and may not even be able to make the trip to Boston that we had trained so hard to do. This year there was only sheer joy and celebration. I quickly joined with Frank who had run the half, Jerry who was out to cheer for us and Belinda, who had also run the half to wait for Karla and Lisa. We didn't have to wait too long before we spotted Lisa making the turn for the finish. Not only did she qualify and set a pr but also broke 4 hours with a 3:59:03, good enough for 3rd in her age-group. And not too far behind was the Marathon Princess finishing well under the qualifying time in 4:00:49, her 2nd fastest marathon. The 3:45 was also my 2nd fastest marathon. What a great day. All three of the training team are Boston Bound. Here is a link to my photos. Jerry used my camera, Frank took some and a couple of friends took some at points along the course. And here is a link to some that Laura took. You are amazing! You took the risk of laying your goal out for all to see. And it was a stretch goal. You busted you a## in training to be ready . . . and then you just went out there and did it! Congratulation! Mission Accomplished! Well done! You did so well! This motivates me again! Congratulations!!!! Tobacco Road was a great race. Well done. LOVED to read this! Very inspirational. So happy that you were able to feel prayers on your run. I have never met you but thought of you so often on Sunday. Hope to meet you soon. Congratulations!!! !